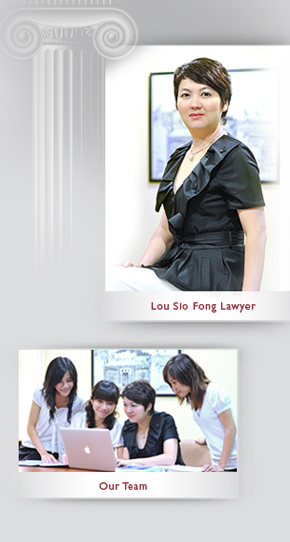 Lou Sio Fong Lawyers & Associates is a law firm established by a Macau local Chinese lawyer. Our partners and lawyers with Macau and Portuguese legal knowledge and substantial practical experience are all graduated from reputable law faculties and universities. Based on our understanding of culture background, political system, judicial system and investment environment of Macau, we are capable to provide professional legal services to clients from Mainland, Hong Kong and overseas. Our multi-lingal ability, including Chinese (Mandarin and Cantonese), English, Portuguese, French, Spanish and German, enable us to communicate with clients from all over the world without language barrier. We provide legal services covering civil law, business law, company law, labor and immigration law, criminal law, real estate law, tax law, gambling law, intellectual property law and financial law. We are not only satisfied with offering legal analysis to clients simply, but also focus on making applicable suggestion and plan to client , in order to ensure that clients benefit from appropriate advice and to protect their valuable right; meanwhile we maintain close relationship with clients. In 2012, we are selected to be listed in the prestige directory of Chambers and Partners Asia Pacific Guide. You could find detail information of the directories produced by Chambers and Partners by clicking http://www.chambersandpartners.com/.